If you have ever had to give your dog a pill, you know it's not a pleasant or easy task. We all love our dogs but not their bad breath or the fight at pill time. Just like human kids, medicine time is no fun. No more going to war with your furry friend. Greenies Pill Pockets are here to help you. One way to hide medicine is with meat, cheese or Dog Treats. After so long your dog will realize their medicine is in the meat or cheese and won't want to take it any longer. Greenies pill Treats can help you and your pet with their dental care. Your dog will enjoy these Doggie Treats without knowing what the Dog Treats are doing for him. Veterinarians recommend brushing your dog's teeth weekly or monthly. When started at a young age, brushing their teeth will make them more comfortable on a weekly basis. We all know as pet owners how difficult this can be with an older dog that is not used to brushing. Now there is an easier way to freshen up bad breath, and your dog will love it. The most popular remedy for bad breath and dental care is Greenies Dog Treats. Greenies pill Treats are a soluble green color toothbrush shape and come in a range of sizes. They are made with easily digestible proteins, minerals, and vitamins. There are no artificial preservatives, flavors, and colors in these Dog Treats. Greenies are made with natural breaking points designed to break smaller pieces off. Our pets are one of our kids and we need to feel comfortable knowing we won't have to worry about our pet choking. To maintain good oral health try using Greenies treats weekly. Greenies Pill Pockets are designed to put the pill in and pinch the ends closed. With the ends closed your dog can't smell the medicine. Pill Pockets come in two flavors: beef and chicken. There are two sizes: tablet and capsules. They contain vitamin C & E for your dog's health. In addition, Greenies Pill Pockets can be used as Dog Treats for training. Doing this will make your dog not always think it is medicine time. For training reason, the treat is small and easy for the dog to chew and swallow quickly. 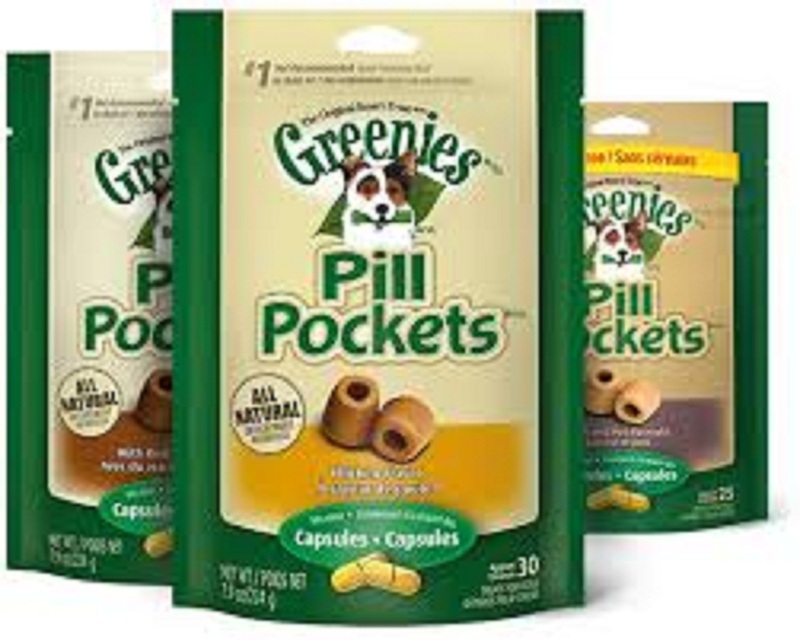 Greenies Pill Pockets Treats are made with natural ingredients; this healthy dog treat comes in a variety of flavors, including chicken, real peanut butter and hickory smoke; they mask the smell of the medication for a stress-free, mess-free experience. If you want to buy this Greenies Dog Treats, I highly recommend you purchase online through Amazon at this link. It's currently on sale here only through Amazon.